Yooju Cheon, London: Frances Lincoln Children’s Books, hb, 978 1 7860 3728 2, £11.99, 2019, 40pp. A beautiful tale told in the simplest of forms with limited palette illustrations, and where the reader becomes intoxicated through the scent of the story. Cat takes her picnic, finds a bench under the beautiful blossom tree and eats her lunch on a ‘sun, twinkling day’. Dog meanwhile, finds the ‘breeze blowing weather’ just right for a walk and a read. 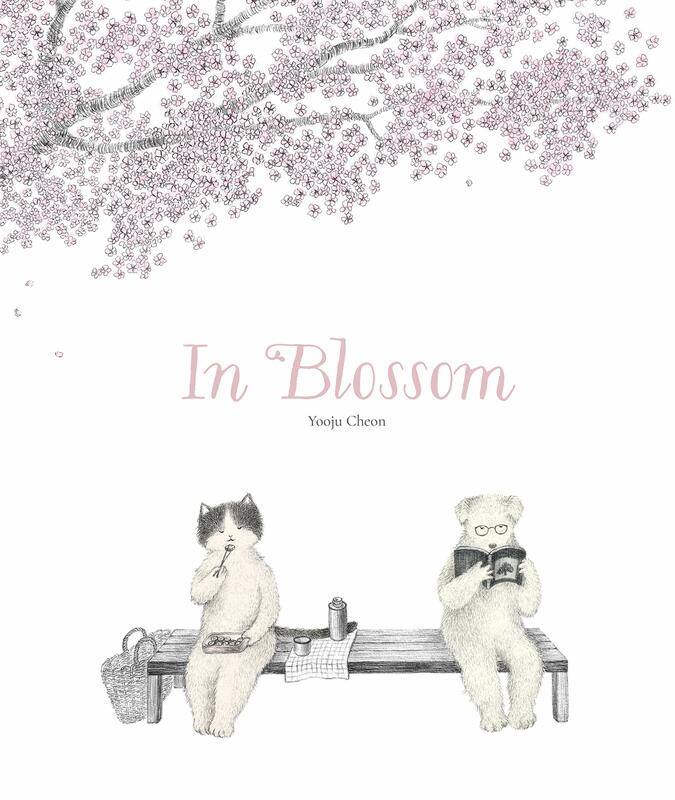 As they both sit on the bench a blossom petal falls from the tree creating a dialogue between the two characters and ultimately uniting them under the fragrant tree. This book highlights the blossoming ancient trees both as a setting and, one might believe, a third character, in which to tell a tale of friendship between the beautifully rendered personifications of the cat and the dog. The pale, limited palette adds to the simplicity of the tale and it was this that was so entrancing to the five-year-old who was reading the story with me. ‘In blossom’ is a beautifully illustrated tale of the blossom tree, peace and friendship that makes a wonderful bedtime or anytime story for all children. Its setting could be any blossom tree, anywhere across the world, which makes its messages so accessible. Much like the beautiful pink cherry blossom at the bottom of my garden, framed by the studio window, yet enticing me to stand under it and smell its beautiful scent, where any number of magical moments might happen.